If you are looking for a tent that offers a lot of space, you may look into getting a 6 person tent. Six person tents offer a lot of space and are great for family camping trips. Since more space means more comfort, they are also great for long camping trips. You may also choose to buy a 6 person tent if you are backpacking with several others. Each of you could carry different parts of the tent to ensure no one is very weighed down. When shopping for a six person tent, there are a few key features to keep in mind. Of course, it can sometimes be hard to decide which tent to buy, so we have put together a list of the top 10 best six person tents based on user reviews. With pre-attached poles, this instant tent could not be easier to set up. It takes just one minute to set up or to take down. The cabin style form factor offers plenty of space. The spacious interior can fit two queen-sized air mattresses. 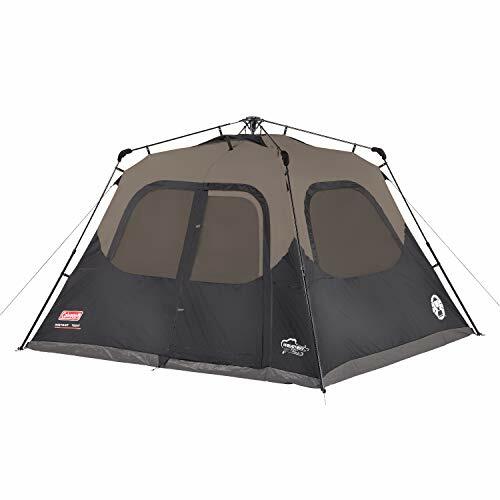 This tent does not have a separate rainfly because all of the seams are taped to provide weather protection with less hassle. The heavy-duty fabric is twice the thickness of standard tent fabrics. 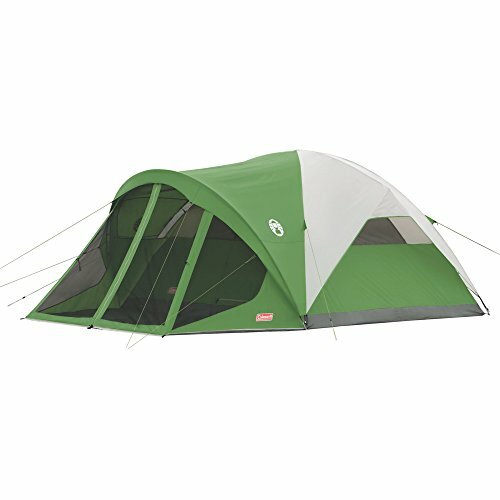 With several windows, this Coleman tent provides excellent ventilation. With so many windows, you will be able to enjoy the scenic views at your camping location. 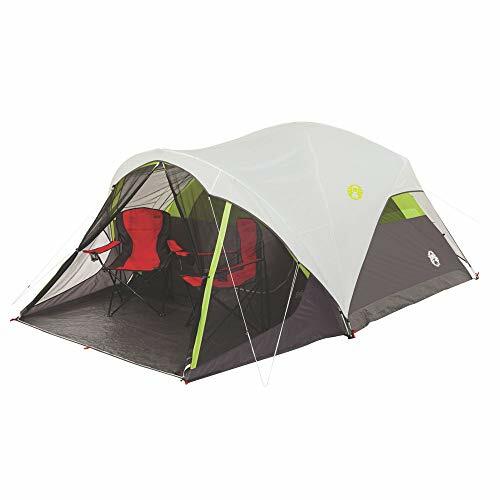 With a large footprint, this tent offers a spacious and comfortable interior. One of the great things about this tent is that is has a fully screened porch. This gives you a nice hangout area where being bothered by pesky bugs. It also provides an area to keep your gear out of the weather. Designed to be completely waterproof, you are guaranteed to stay dry inside even in very rainy conditions. The four large windows provide excellent ventilation and also allow you to take in the scenery. 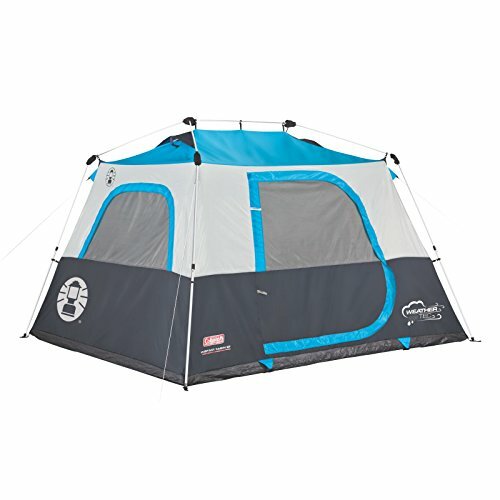 This tent has been designed so that is easy to set up and easy to take down. This tent has 2 rooms instead of just one which is great when camping with other adults or children. This is a great family camping tent. The floorless screened-in porch provides extra ventilation and space when eating meals, playing games, or just hanging out. Since it is protected by the rainfly, you can spend time in that area even when it is raining. The color coded poles, continuous pole sleeves, pin-and-ring design, and InstaClip attachments make the setup process very easy. For superior weather protection, the seams of the rainfly are fully taped and the tent fabric is waterproof. The floor is welded and has inverted seams to make sure you stay dry. With 2 doors, 6 campers can easily enter and exit the tent without disturbing each other. The strong 8.5mm fiberglass frame and dome design make the tent stable even in windy conditions. The hooded fly provides ventilation when it is raining. The large rear mesh window and vents allow a cross breeze to flow through the tent, keeping you cool and comfortable. The bathtub style floor is durable and designed to keep water out. Using the electrical access port, you can run AC power into the tent. With continuous pole sleeves and a clip design, this tent is easy to set up. When there are high winds, you can attach guy lines to keep the tent more stable. Pitching a tent could not be easier with this Coleman instant tent. The poles are pre-assembled and attached to the tent, allowing you to set up this tent in under 1-minute. You will spend less time getting the tent pitched and more time having fun. The built-in rainfly makes assembly even easier and ensures that you stay dry when it is raining. The welded floors and inverted seams further ensure protection from water leaks. The spacious interior has room for 2 queen-sized airbeds. The Illumiline™ guy lines are reflective so you can see them at nighttime. Since this tent is a cabin style, it provides more interior space, making your camping trip more comfortable. With a 9X6 foot screened-in room, this tent offers more space for lounging in a bug-free area. The built-in lighting system can be used on 3 settings- high, low, and nightlight. With 2 rooms, this tent can comfortably sleep 6 people. 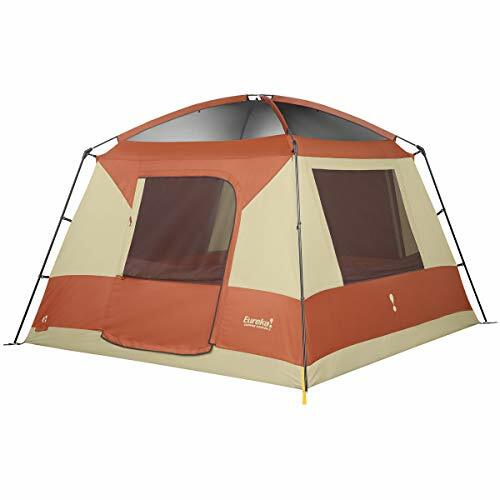 This tent has a room divider which makes it great for family camping or sharing the tent with friends. The hinged door makes it easier to get in and out of the tent. The cabin design makes for a spacious interior. The 2 rooms in this dome tent will comfortably sleep up to 6 people. It features 3 mesh windows and a mesh ceiling to provide superior ventilation. The double D door design allows for easy entry and exit. Store your things using the two interior mesh pockets. This cabin style tent offers a large interior and 4 windows which provide ventilation and visibility. It has a unique frame which is made of a combination of steel and fiberglass, making it strong and sturdy. The roof is mesh which allows for great airflow and reduces condensation. The window awnings allow you to keep the windows open even in the rain for ventilation. The pre-attached poles make this tent easy to set up. This tent has a screened in porch to provide you with a bug-free lounging area. Here are some important things to consider when you are in the market for a six person tent. One of the most important things buyers look for when choosing a tent is durability. You want to choose a tent that will hold up in the wind and rain. It should be good quality so that you can get many years of use out of it. Pay attention to the tent fabric and frame. The frame needs to be strong and not easily give out in windy conditions. If your tent has a rainfly, make sure it is fully waterproof. Some tents don’t have a rainfly but are fully taped to avoid water leakage. Bathtub style floors are best since they lower the chance of water leakage. Another important thing to keep in mind when looking for a tent is the level of comfort it offers. This is especially important if you will be taking family camping vacations. What makes a tent comfortable is its size. Pay attention to the floor space a tent offers to see if it will be big enough to comfortably fit you and your companions as well as your gear. The height of a tent also plays a key role in comfort. Having to crouch inside a tent is not ideal. Choose one that you can at least stand straight up in the middle of. For maximum space, choose a cabin style tent. If you are tall, be sure to pick a taller tent. You will also notice that some tents have an attached screened-in porch. Screened-in porches are great spaces for playing games or just relaxing. Since they are screened, you don’t have to worry about bugs. Make sure you get a tent with adequate storage. You will need places to put your small items so that you can keep the tent organized. Look for a tent that has storage pockets so that you have a place to put your things. You probably don’t want to spend an excessive amount of time setting up a tent, so make sure to buy one that is easy to set up. This is especially important if you don’t have experience setting up a tent. Free-standing tents are easier to set up. Pay attention to the pole design to see if it will be complicated to pitch. Some tents have special pole designs to make setting up easy. Of course, the easiest tents to set up will be instant tents. There is no assembly of pieces required, you just unfold the tent, extend the poles, and lock the poles into place. You can do this in 1-minute or less. Instant tents are great for first-time tent buyers and others who don’t want to spend a lot of time getting a tent set up. There a few styles you will see when it comes to 6 person tents. It is good to know these styles to figure which kind of style you want and which features are most important to you. Traditional camping tents have just 1 room. This can make camping trips more social and many prefer one room tents for their simplicity. If you are a couple camping by yourselves and you want a 6 person tent for lots of space, you will prefer the traditional 1 room tent. Since most people buy larger tents when camping with their family or friends, some people prefer 2 room tents. Tents with 2 rooms provide more privacy. If you will go camping with your kids, it is convenient to be able to put the kids in one room and adults in the other. Or if you are going camping with other adults, having 2 rooms will give everyone their own space. Two room tents are also nice if you want to use one room to store most of your gear. This will help keep the tent more organized. If weight is an issue for you, you may want to stick to a 1 room tent since 2 room tents generally weigh more. Most traditional tents that you have seen likely have one door. With a smaller tent, 1 door is all you need. Even many larger tents have just one door and that suits many people's needs just fine. But when you are looking to buy a bigger tent, you might consider getting one with 2 doors. When you are camping with many others, there are some advantages to having a 2 door tent. 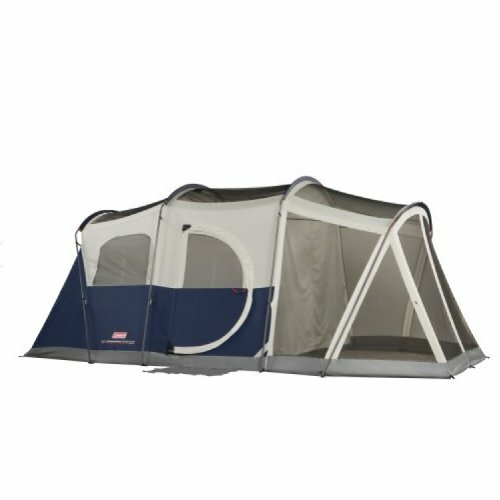 This makes it convenient to enter and exit the tent without having to crawl over your partners. When someone is resting, you won’t have to disturb them when you want to go in and out of the tent. Having two doors is also nice if the tent has 2 rooms. When a tent is divided into 2 rooms people will have their own areas, whether its parents and children or couples sharing the tent. Since everybody will have their own space, having 2 doors allows for further privacy and convenience. Choosing a 6 person tent is not very difficult once you know what to look for. Decide first what you will be using it for and what kind of weather you will be camping in. Will you be using the tent for family vacations or for backpacking? Will you be camping when there is a chance of rain? Be sure that the tent is waterproof. Then think about how many rooms and doors you want the tent to have. This will narrow down the options. Make sure to choose a tent that is durable and comfortable. It also should have some storage pockets so that you can keep your things organized. After you decide what you want a tent, be sure to check out our top 10 picks based on 6 person tent reviews. Getting a good quality tent will be well worth it even if you have to spend a few extra dollars.